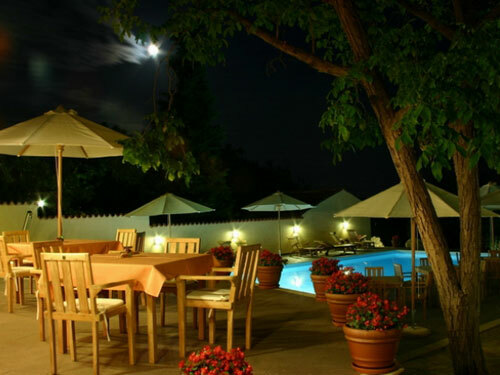 Situated on a hill, 5 km distant from the sea, 30 km from the Italian border and nearby the most famous touristic centres of the territory, immersed in the traditions and tranquillity of the picturesque rural village of Brtonigla/City of Wine, you will find the Hotel San Rocco. From an old peasant property and following the high class restoration to its former glory, this exclusive tourist resort has been built. 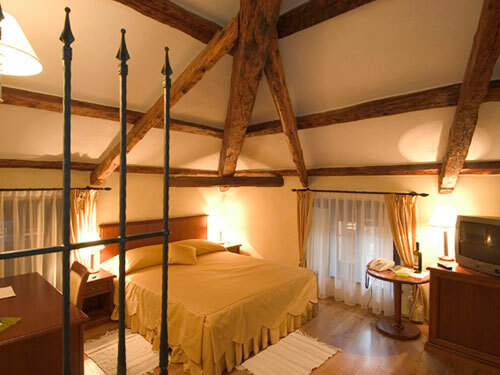 It offers all the comforts of what you would expect from the modern European standard; typically for afour star hotel. The members of the Fernetich family, owners of the hotel, Tullio, Rita, Teo, Luana and Rocco will be at your service to provide you with a very pleasant stay in the surroundings of exceptional beauty, intimacy and elegance. The complex consists of three buildings: the first was once a Master's villa, where aside from the reception, restaurant, and elegant wine-bar, there are communal areas and 10 stylish rooms, some of which have a sea view and others overlooks the picturesque town. 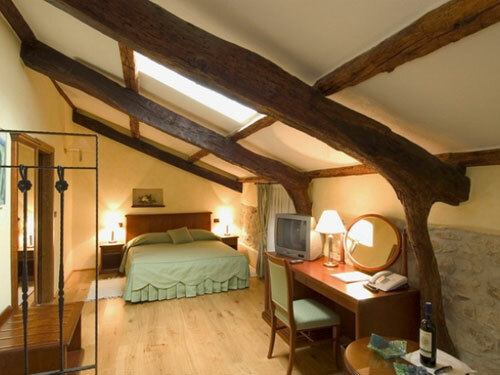 All are different from one another, some with disabled facilities, and furnished in a classical style with old ceiling beams. The second building which was once the stall of the Istrian oxen "boškarin”, is today an elegant and intimate location for all types of functions. This building houses the restaurant’s wine cellar with a vast choice of regional and international wines. On the first floor there are two other bedrooms. The elegant restaurant drawn by the spaces where once the good family’s wines Malvasia and Terrano were produced, offers a vast gastronomic array based mainly on typical seasonal specialties, such as fresh locally caught fish, truffle, mushrooms, ham, game and other typical Istrian specialities. With your desired dish you will have a vast choice of regional and international wines from our wine cellar. 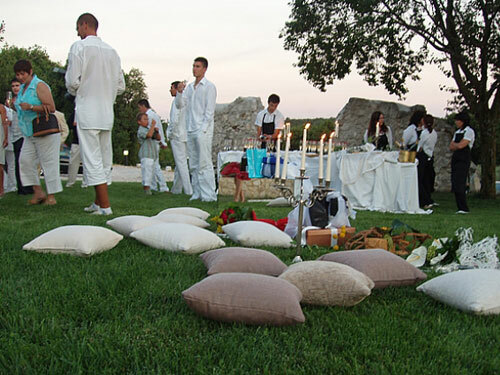 The restaurant San Rocco is the number ‘one’ of the Croatian and Istrian gastronomy; it is also included in the Best National and International Enogastronomic Guide and has obtained innumerable prizes and recognitions. In the centre of Verteneglio, to enrich the exclusive enogastronomic offer of the restaurant San Rocco, we have decided to offer our guests something new. 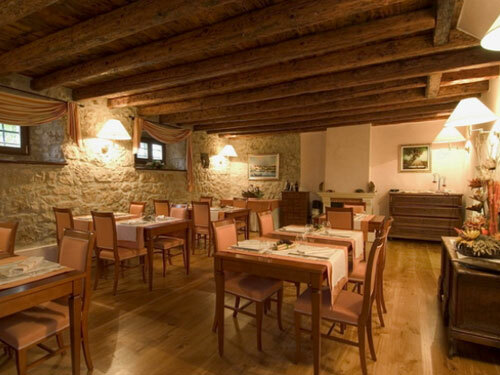 This is a place where you can taste traditional Istrian dishes, delicacies from the wood fired oven, excellent pizzas and all accompanied by the best local wines. The territory of Verteneglio "City of Wine" is known for its long tradition of the production of wine and olive oil, and here you will find the largest area where the wines of Istria are produced. Precisely for these reasons the Vinoteca San Rocco is an attractive place for those who want to experience being in the centre of a typical Istrian town, its rich history and all the best that nature and the farmers hard work has to offer, and also be able to take away a typical gift from Istria!